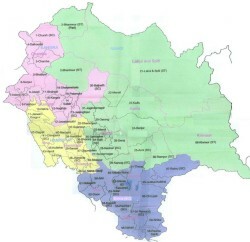 Himachal Pradesh completes 41 years of Statehood today. 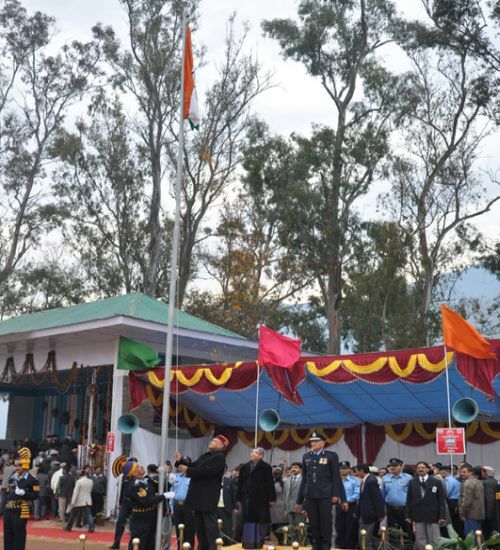 State Level function was organized to mark the occasion at Sundernagar in Mandi district today where Chief Minister Prem Kumar Dhumal unfurled the National Flag and took salute at an impressive march past presented by Police, Home Guards, NCC. Kulbhushan Verma, Deputy Superintendent of Police commanded the Parade. Speaking on the occasion, Prem Kumar Dhumal felicitated the people of the State on Statehood. He said that started from humble beginning in 1971, the State had emerged a pioneer in development not for hill areas but also amongst other States also in the Country. He said that the State’s development indicators like Per Capita Income, State Gross Domestic Product and Literacy Percentage were the best in the Country today. He said that the Per Capita Income which was Rs. 651 only in 1971 had gone up to Rs. 18,493 in 2011 and State’s Gross Domestic Product from Rs. 223 crore to Rs. 52,426 crore. The literacy percentage of the State is 83.8 percent today whereas it was only 23 percent in the year 1971. Prem Kumar Dhumal said that his Government was committed for the speedy development of the State besides ensuring welfare of all sections of the society and added that focus of the policies and programmes initiated during last four years had remained this. The Government was ensuring that benefits of the programmes of the Government percolate down to the common man first. Chief Minister said that development in rural areas had been speeded up and agrarian economy was being strengthened. He said that 12 percent of the total budget was being spent on Agriculture and allied activities. More than Rs. 1100 crore had been spent in this sector during last four years. State had also got ‘State Agriculture Leadership Award’ in the year 2010, he added. On the occasion of the Statehood day Chief Minister announced that 2000 water guards would be kept for maintenance of Water Supply Schemes in rural areas. He further announced the enhancement of honorarium of water guards from Rs. 750 to Rs. 1350 per month. This would benefit 4220 Water Guards in the State. Chief Minister announced that 100 Junior Engineers would be appointed in the Irrigation and Public Health Department so as to better water supply for fields as well as habitations in the State. Chief Minister announced 14.40 lakh for Gymnasium Hall at Mandi, Rs. 36.33 lakh for Indoor Stadium Badrinagar (Poanta Sahib), Rs. 15 lakh for Stadium of Govt. Senior Secondary School, Mohri (Mandi), Rs. 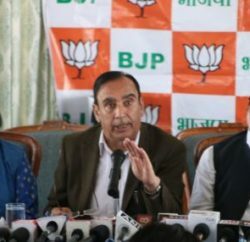 6.86 lakh for High Mast lights in Vikram Batra Stadium, Palampur, Rs. 25 lakh for Town Hall Mandi, Rs. 12.17 lakh for Wrestling Stadium at Chehar (Ghumarwin), Rs. 25 lakh for Stadium in Govt. Senior Secondary School , Karsog, Rs. 20 lakh for boundary wall of Chamoha ground Nahan, Rs. 10 lakh for Outdoor Sports Complex Dhalpur, Kullu, Rs. 5 lakh for Sports Stadium Jubbal, Rs. 15 lakh for Shooting Range at Nahan, Rs. 94 lakh for Synthetic Track Dharamshala, Rs. 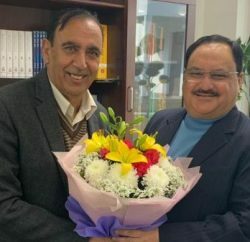 90.06 lakh for Sports Complex Dharamshala, Rs. 16.68 lakh for Volley Terra Flex Flooring at Una, Shimla and Dharamshala, Rs. 1 crore for Indoor Stadium Rohroo and Rs. 1.22 crore for Synthetic Track Hamirpur. Chief Minister also announced upgradation of Govt. Middle School Bandli to Govt. High School, Govt. Middle School Dharanda to Govt. High School, Govt. High Schools Porhi, Kothi, Maloh to Govt. Senior Secondary Schools. Chief Minister also announced Rs. 83 lakh for Mini Secretariat, Sundernagar, Rs. 50 lakh for HRTC workshop Sundernagar. Rs. 3.31 crore for Integrated Housing and Slum Development Programme Sundernagar. Chief Minister announced cash incentive and tax exemption under Mukhyamantri Gram Path Parivahan Yojna so as to encourage people to take routes under the scheme in interior areas of the State. For 29 seater it will be Rs. 2000 per month, for 22 seater Rs. 1500 per month and for 17 seater it will be Rs. 1000 per month. Gulab Singh Thakur, PWD Minister, Ravinder Singh Ravi, Irrigation and Public Health Minister, Narinder Bragta, Horticulture Minister, Jai Ram Thakur, Rural Development and Panchayati Raj Minister, Mahender Singh, Transport Minister, Dile Ram, MLA and Chairman HP State Finance Commission, Roop Singh Thakur, Col. Inder Singh, Hira Lal, Vinod Chandel, Rajwant Sandhu, Chief Secretary, Dr. D.S. Manhas, DGP and other senior officers were present on the occasion. A colourful cultural programme and police band display was also organised on the occasion.